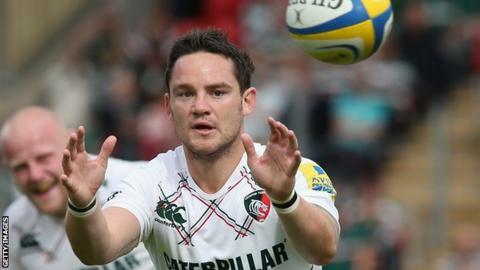 Worcester Warriors have signed stand-off Ryan Lamb from Leicester Tigers to help their battle against relegation from the Premiership. Gloucester-born Lamb, 27, who began his career with his home town club under Warriors boss Dean Ryan, joined Leicester a year ago. But, after a 10-point debut haul against Worcester in September, he has made only three Premiership starts. Lamb is available to make his debut on Saturday at Northampton. It would see the former Saints number 10 face another of his old clubs, having spent two seasons at Franklin's Gardens before moving to Leicester. Prior to that, he had two seasons with London Irish, whom he joined in 2009 following five years at Gloucester. "I've really enjoyed my time at Leicester," said Lamb. "But a lack of game time meant that when the opportunity to join Worcester came up, I didn't want to pass it by. "I've obviously worked with Dean Ryan before at Gloucester and, after finding out what he's building at Worcester, I was excited and wanted to be part of that journey and part of that new culture." Lamb has signed for a Worcester side who lie 10 points adrift at the foot of the Premiership, having lost all 13 league matches, picking up just four losing bonus points in the process. The most recent bonus point came in Friday's 23-22 defeat by champions Leicester at Sixways. Ryan said: "I am looking forward to renewing my relationship with Ryan at the Warriors, where we have a different challenge to those we have faced before. "Friday night was a huge performance and a huge effort, but we need to be able to replicate it - starting with next week. "We earned respect in all the right ways but we are still learning how to be a team and it's still only one point."